Golden Bay Holiday park is located on the beach in the centre of Golden Bay, halfway between the Abel Tasman National Park and Farewell Spit. 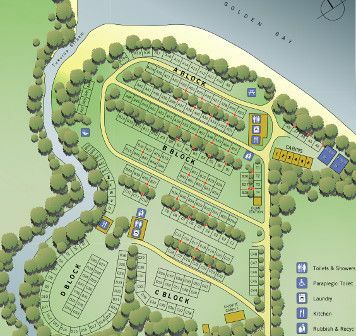 It is a spacious park comprising 210 campsites, 2 luxury apartments, 6 cabins and a self-contained cabin. The park is in a rural area at the end of a private road and is bounded by bush and pasture, with a river down one boundary and fronted by its own private beach. There is no street noise, and no street lights to disturb the natural setting. In the morning the sun rises out of the sea, and a beach fire in the evening is the perfect way to finish your day. The park was once a farm and is mostly made up of level areas suitable for camping and parking motorhomes and caravans. Tukurua stream runs along the park's northern boundary. It has a bush walk along its length and where it meets the sea is a safe place for toddlers to play and swim. There is also a playground for smaller ones. The beach is owned by the campground and private; the only access is through the campsite. It is part of the larger Tukurua Beach which only has public access at its southern end 2 km away. It is a safe swimming beach which rarely has big surf and never has rips. There is fishing directly off the beach (low tide is best) and we have a boat ramp directly from the park onto the sand. We have plenty of overflow parking to keep your boat safe but not filling up your site. The campsite has 2 kitchen blocks and 2 ablution blocks. These are all open in peak season, but the minor kitchen and ablutions block are closed through the low season. The main kitchen has gas cook-tops, 2 ovens, toasters, microwaves, zip, fridges, freezers. Pots and pans are not supplied. There is also a lounge and dining area with TV and internet kiosk. The minor kitchen has electric cook-tops, toasters, microwaves, zip, fridges, and freezers. Pots and pans are not supplied. Both ablution blocks have showers, toilets and a laundry. Water comes from a private scheme and is expensive (and scarce in summer) so we have to charge for our showers. Showers needs a $1 coin. The laundry is $4 for a wash load, and $4 for the dryer.